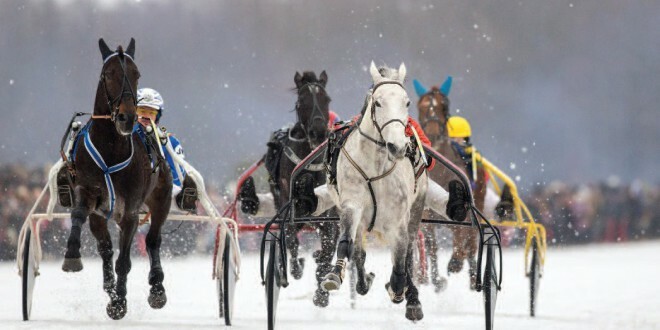 The history of horse racing on the ice at Dusetos dates back more than two centuries. There is even a legend of how all of this got started: around Dusetos there once lived a wicked landowner. A serf asked permission to marry a beautiful young girl, but the landowner was interested in her as well, and he quickly devised a plan to get the girl for himself. The landowner suggested to the serf that they race horses on the frozen lake, and that the winner would get the girl. The landowner harnessed the swiftest horses he owned, while the serf was left with an old mare he had ridden into town; yet somehow, and it is unclear how, the young serf won the race. The landowner was so angry that he ordered the winner flogged, but at that moment the ice broke under the landowner’s feet, and the lake swallowed him up together with his sled and all of his swift horses. A less romantic explanation of how this race came into being at Dusetos revolves around a Catholic festival. The horse race is held in the beginning of February during the feast of the Presentation of the Lord, one of the biggest parish festivals. Large groups of people would come to the parish festival, and it was the perfect opportunity for farmers to demonstrate whose horse was the fastest and to place bets on the race as well. 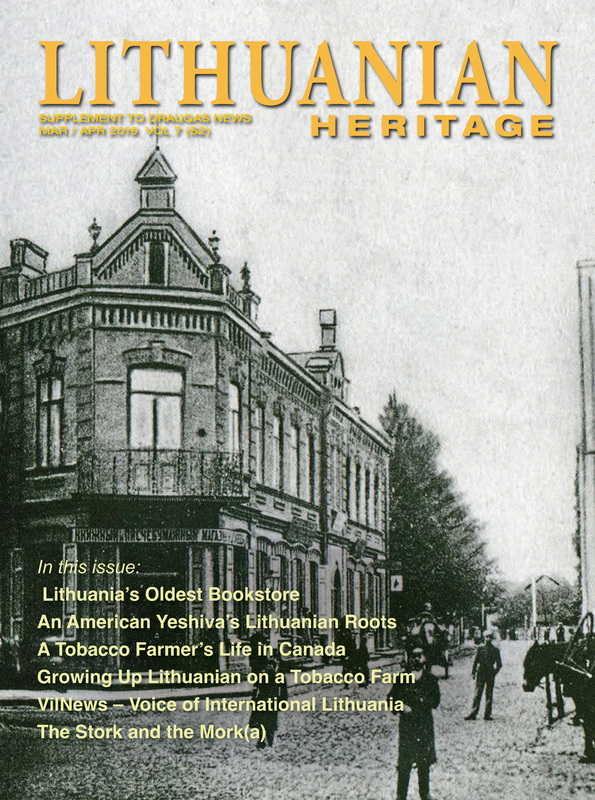 The races in Dusetos, which were started in 1905, had a major impact on the development of horse breeding in Lithuania. In 1930 the Lithuanian government purchased a pure-blooded race horse named Šachtior, one of the swiftest and most beautiful horses of the Orlov breed. The government bought the horse for purposes of racing and breeding. Reports spread quickly about this wonderful horse. No other horse could equal him in height, speed or beauty. Each year more and more participants and more and more spectators would gather by the frozen Lake Sartai to view these horse races. 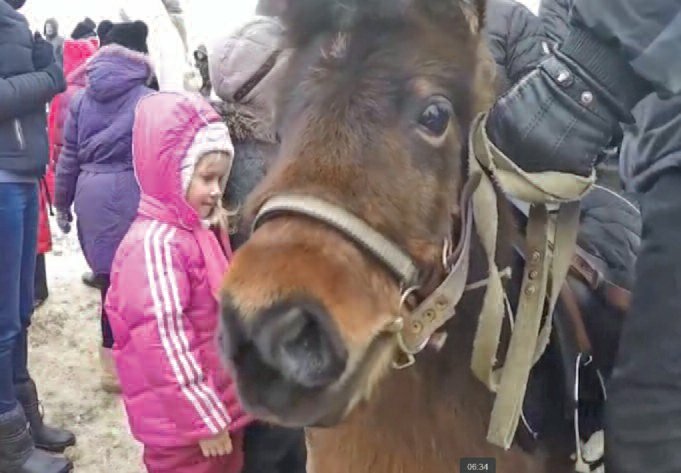 The annual event attracted the interest not only of the representatives of various organizations, but also that of the Lithuanian government and the Ministry of Agriculture, which in 1933 created prizes for the owners of the swiftest horses. The horse races became officially sanctioned and rules were created, according to which the horses were divided by category. Participants had to pay a set fee, and the collected fees were put into a fund that was then used to award prizes to the winners. 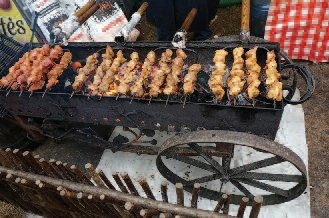 What‘s a festival without šašlikai? So what about the most recent Sartai horse race, which took place on February 7, 2015? This past winter the weather was changeable and capricious, and organizers of the festival had to battle vigorously with the elements. Yet, they prevailed and were able to put together a track on which the ice was sufficiently thick for racing, even though it was not ideal for breaking records. On race day it was cloudy and windy, but this did not discourage the spectators who were in a good mood and who streamed in by the thousands to participate in what is the biggest and most famous winter festival in Lithuania. Racetrack on frozen lake Sartai. 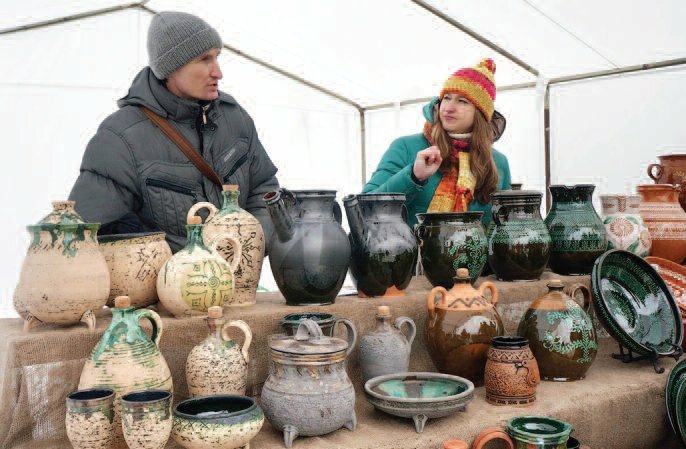 From early morning the folk art fair was bustling with sellers of pitchers and baskets, woven sashes and wood carvings, barrels and clay pots,as well as paintings, carved sculptures and bouquets of dried plants, honey and all other sorts of goods. Even the most discriminating buyer was able to find something, and no one went home without a unique present. Folk art fairs have been a part of the races at Lake Sartai from 1968 onwards. Recently the number of folk artists had diminished because sales of food and other products having nothing to do with national traditions became prominent and also because of the high cost of a spot at the folk art market. 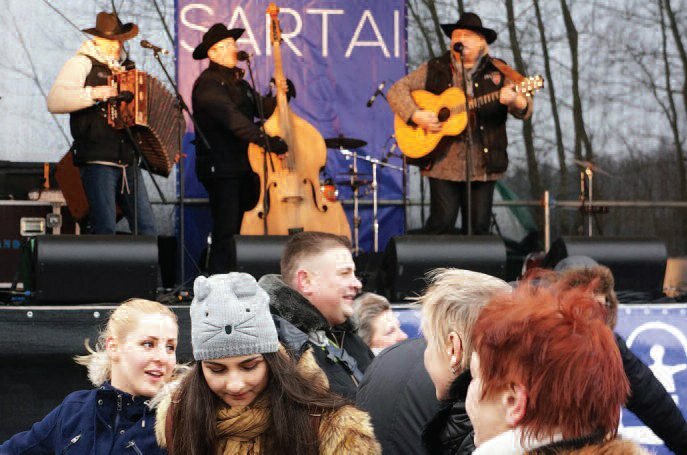 This year those artisans whose works reflect Lithuania’s national heritage were given a special opportunity to market their wares in a comfortable heritage zone where no fee was required. The purpose was to help rejuvenate pure folk art traditions and to interest traditional craftsmen in participating. Artisan pottery is one of the many folk art items available. Even though the temperatures during race day were not uncomfortably low, the spectators could feel wind and moisture clinging to their clothes, and so during breaks between the races, they helped themselves to good food and hot tea and watched dances performed on a stage. Music and dancing keep the energy and happiness flowing. The folklore ensemble from the Cultural Center of Dusetos put on a spirited performance, as did folklore ensembles and country bands from other towns and villages, such as Antazė, Smalvos, Samaniai, Zarasai, Daugailiai and Antalieptė, as well as a dance group from Ignalina. As the bands took turns performing, Rima Vitaitė and Antanas Laurinkevičius, the masters of ceremony, announced each group, and, as always, added a dose of humor and good cheer. Folk dancers also do their part. 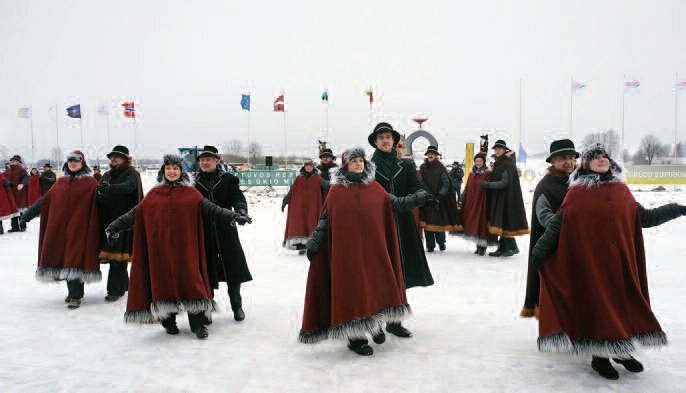 Three dance groups, folk dance ensembles from Zarasai, Visaginas and Ignalina, opened the festival with a choreographed performance entitled ‟A Greeting for Sartai.ˮ A brass band from the Ministry of the Interior accompanied the ensembles as they marched in on the racetrack on the ice. The appearance of Samogitian horses was a pleasant surprise. These horses have become a part of Lithuania’s national equestrian heritage. After welcoming words from a variety of officials, E. Gudonis, winner of the Sartai 2014 races and holder of the track record, raised the official flag for the event. The head referee, Asta Muntvidaitė, was given the privilege of lighting the race cauldron. The pastor of Dusetos parish, Canon Stanislovas Krumpliauskas, blessed the event and wished everyone a successful competition. Before the race began, there was a moment of silence to honor Mečislovas Preišegolavičius, who had passed away a year ago after the last running of the Sartai races. He was truly a legend in the sport of horse racing;he had given more than four decades of his life to this event. 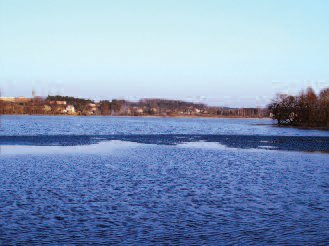 The opening ceremonies concluded with the Sadūnai singing the traditional anthem of the race, ‟Un Sartųˮ (‟On the Lake of Sartaiˮ). 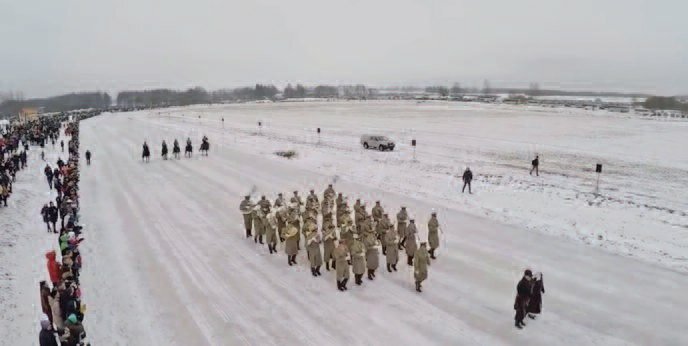 Sixty-one horses from the three Baltic countries, Sweden, Finland, Norway, France and even from Canada, participated. Following tradition, the youngest horses, the threeyear olds, competed first in the distance category of 1,609 meters. The first to cross the finish line was Jevgenij Ivanov, a guest racer from Estonia, with his horse Hypnotist. He covered the distance in 2 minutes and 7.14 seconds, to the applause of the large group of spectators who had filled the tribunal and the areas around the racetrack. In the 2,400 meter race the winner was S. Kėrys, a perennial competitor in these races and a former holder of the track record. He won the race with his horse Pronto Ribb covering the distance in 3 min. and 16.55 seconds, almost a second ahead of the other competitors. Mindaugas Seržantas with his horse Bucky Augustinas won the prize in a race for older horses,covering the 2,400 meter track in 3 minutes and 9.6 seconds. The fourth race was for the prize of the Parliament of the Republic of Lithuania. The spectators cheered on the renowned jockey S. Kėrys and his horse Sakalas, who had held the track record until last year’s races when E. Gudonis broke it. The spectators greeted this 11-year-old horse and his jockey with particular respect, and the jockey and his horse responded by crossing the finish line first, with a time of 2 minutes and 5.38 seconds. The longest race on the program covered a distance of 3,200 meters. The winner was J. Ivanov with his horse Up to Belle. He cov-ered the distance in 4 min. 20.31 seconds. 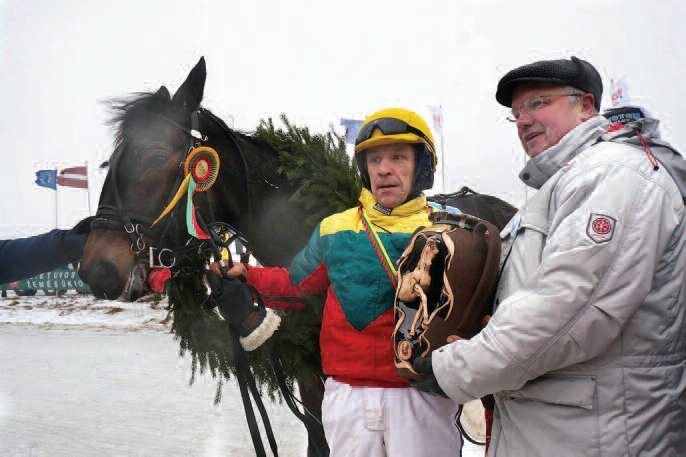 Saulius Matulevičius, with his horse Bellatrix Cass, won the Eiklusis žirgas prize, covering the distance of 1,609 meters in 2 min. and 10.94 seconds. And coming in for the home stretch. The races did have one unfortunate incident – one of the favorites, Kazys Trotas, was disqualified when his horse Koranas, who had been in the lead, began to gallop. E. Gudonis, with his horse Luna Augustinas, won the prize established by the Zarasai municipality by finishing his race in 2 min. 17.75 seconds. Among the seasoned competitors for the Dusetų kraštas prize was the youngest competitor in the races, Dainius Perednikas, from the city of Ukmergė. Dainius will turn 15 this summer. Even before the competition began, Dainius had already won a prize – the 500 euro prize established by former President Algirdas Mykolas Brazauskas, who especially liked this festival. The prize is awarded to the youngest athlete in the races. Aurimas Sakalovas, who jockeyed the horse Serenade Crache from the Kasandros grupė Company, won the Dusetų kraštas prize. The competitors for this prize were the jockeys who were driving adult D-rated horses. Aurimas Sakalovas covered the distance of 1,609 meters in 2 minutes. The loudest spectator applause as well as march music from country brass bands, greeted Eimantas Klebauskas from the city of Varėna. His mare Ladybird Va Bene crossed the finish line first in the main race of the competition. The length of the track was 1,609 meters. Even though the time of 2 minutes 3.991 seconds was less impressive than the track record of 2 minutes 0.775 seconds, which Egidijus Gudonis achieved last year, the winner of this race is considered to be the champion of the races. After the cauldron of the races was extinguished, after the conclusion of these races, which had provided so much joy and adrenalin for the horses, their jockeys and the spectators, the festival continued in the Cultural Center of the Art Gallery of Dusetos. There the traditional international exhibit entitled “Horses in Photographs” was opened. 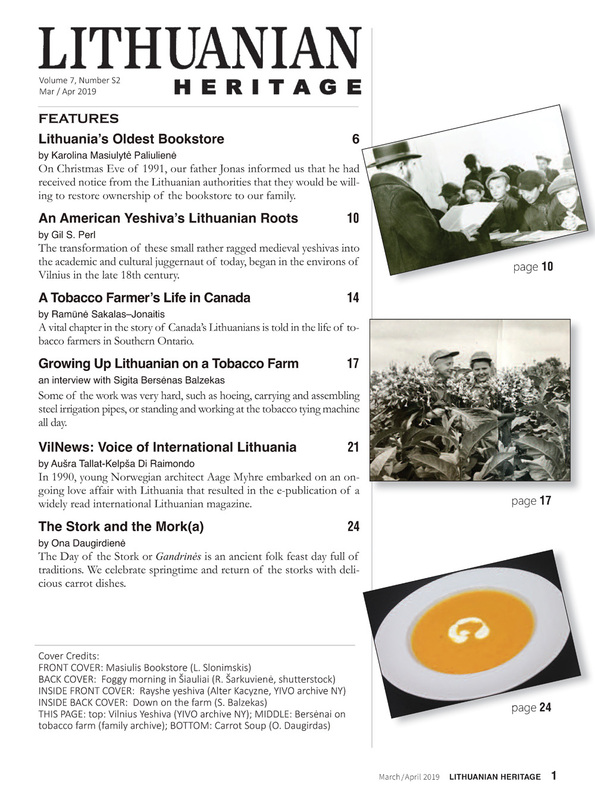 Prizes were awarded, and the new catalogue of the exhibit was introduced. The holiday concluded with a concert by the group Alibi, headed by Inga Valinskienė. And so goodbye until next year, until the next races!